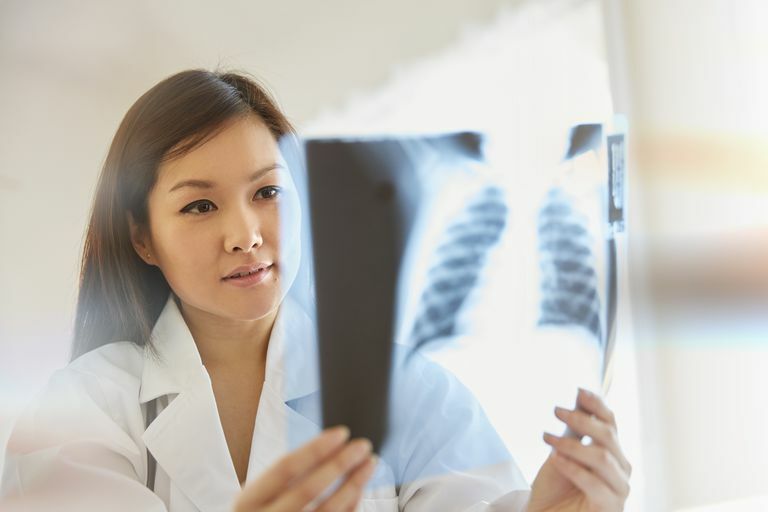 While most asthma specialists do not usually find a chest X-ray helpful in diagnosing asthma, they may suggest the screening method in order to determine if other conditions are present in the lungs, heart, or chest. An X-ray is​ a type of screening test that takes a photographic or digital image of the structures inside the body. It is a painless and fairly quick screening that passes X-ray beams (a small dose of radiation) through the body to be absorbed to different degrees by different materials. X-rays hold a very small risk for radiation exposure (the amount being equal to a normal day’s exposure to the sun). A chest X-ray ​can be ordered when a patient with asthma is hospitalized (as part of a preoperative physical exam) or treated in the ER because of a severe asthma attack. Asthma patients who also have symptoms suggesting lung or heart disease may get chest X-rays as part of their annual exams. Chest X-rays are also useful if other conditions, such as pneumonia or lung tumors, are suspected. A chest X-ray, however, can also appear normal in patients with milder forms of lung disease or with very small tumors. It is therefore not a precise test. Cardiac problems, including an enlarged heart or heart failure. X-rays are usually taken by a trained and certified radiology technician. Patients who are undergoing an X-ray of the chest will put on a special gown and remove all metallic items, including jewelry so that they don't block the X-ray beam from penetrating the body. The X-ray technician may ask the patient to inhale deeply and hold her breath during the procedure to inflate the lungs and make the various chest tissues more visible. X-rays may be taken from the front, back and side views, and from different camera angles while sitting, standing or lying down. Once the X-ray has been taken, the exposed film is placed into a developing machine and the image is examined and interpreted by a radiologist (a physician who specializes in the reading of X-rays). After the radiologist reviews the X-ray, he or she will send a report to the doctor who ordered the test. This doctor will then discuss the results and recommended treatment options with the patient. The risks of chest X-rays are minimal, especially because today's high-speed film does not require as much radiation exposure as the type of film used years ago. However, any exposure to radiation has some risk, which is why the technician asks the patient to wear a lead apron over the reproductive parts of the body or the extremities to shield from exposure. Pregnant women should ask their physicians before having an X-ray taken, as this could harm the fetus. "Chest X-ray." MedlinePlus. U.S. National Library of Medicine and the National Institutes of Health. "How is Asthma Diagnosed? "National Heart, Lung and Blood Institute, Diseases and Conditions. U.S. Department of Health & Human Services, National Institutes of Health.